Preheat oven to 180°C/350°F. Peel bananas and mash them with a fork. Chop walnuts. Beat softened butter and sugar in a bowl for approx. 3 min. or until very light and creamy. Add the egg and vanilla extract and beat to combine. Mix most of the flour with the baking powder, baking soda, and a pinch of salt in a small bowl. While mixing on low speed, slowly add dry ingredients to wet ingredients and mix until a smooth batter forms. Fold in mashed bananas. For the crumb, add remaining flour, chopped walnuts, oats, brown sugar, cold butter, and a pinch of salt to a bowl and mix with your fingers until just combined. 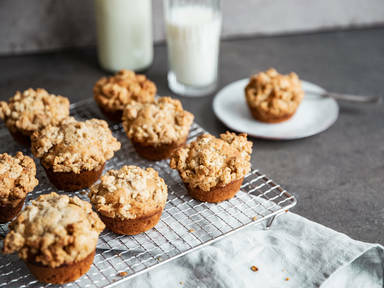 Grease a muffin tin and use an ice cream scoop to add an equal amount of batter into each cup. Sprinkle evenly with crumble topping. Transfer to oven and bake at 180°C/350°F for approx. 20 min., or until golden brown. Enjoy!